The Adventures of Cassie: Yarn Yarn! I finally got these two skeins of yarn done today, and I thought I would share them. 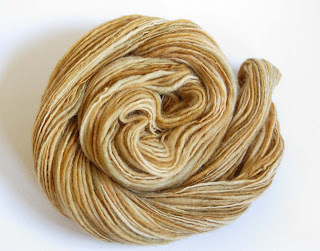 I have named the color-way "Dessert Plains," and it is 100% domestic wool. 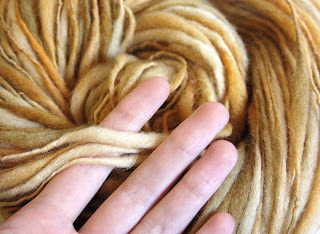 The bulky skein is 106 yards, and the worsted weight skein is 158 yards. Hi Cassie -- Thank you for your comments about my wheel and dog. Your yarn is beautiful! I love it. I am originally from MN and have lots of family in the Rockford region of IL. Enjoy your wheel. I look forward to seeing more of your yarn. A few goodies in the mail.